The “Wings of Wonder” Bird Encounter, which started in 1983 by Gary Denzler, was one of the country’s earliest bird encounters. The encounter originally consisted of only a few birds. Today, the e ncounter consists of twenty-four different species of birds, mammals, and reptiles. They implement a variety of behaviors from flying, calling, mimicking, climbing, and outsmarting their trainers. Some of the encounter animals include an Emu, Black-Footed Penguin, Hyacinth Macaw, Harris Hawk, Lanner Falcon, Abyssinian Ground Hornbill, and Bald Eagle. Catch the Ameritas Wings of Wonder Bird Encounter Wednesday – Sunday at 1pm & 3pm between Memorial Day and Labor Day! Click here for more animal encounter schedules. Come see the Bird Encounter in action at the Zoo between Memorial Day and Labor Day. Our encounters are located at the Wings of Wonder Amphitheater and are free with admission to the Zoo. Don’t miss this educational and entertaining look at some of the zoo’s exotic animals. When is the Bird Encounter at the Zoo available? Memorial Day Weekend – Labor Day Weekend, 1:00 pm & 3:00 pm, except on Mondays and Tuesdays. 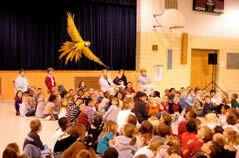 The Bird Encounter staff offers traveling encounters that are great for all ages, organizations and events.